VALLEY, Virgin Gorda, VI- In what many described as a bomb shell revelation, information the public, many backbenchers, the Opposition in the House of Assembly (HoA), civil society and the media have been saying for many months, even before hurricanes Irma and Maria, the National Democratic Party (NDP) Government has left the country broke. This has been confirmed by yet another backbencher, this time Dr The Honourable Hubert O'Neal (R9) [Virgin Gorda & Anegada]. 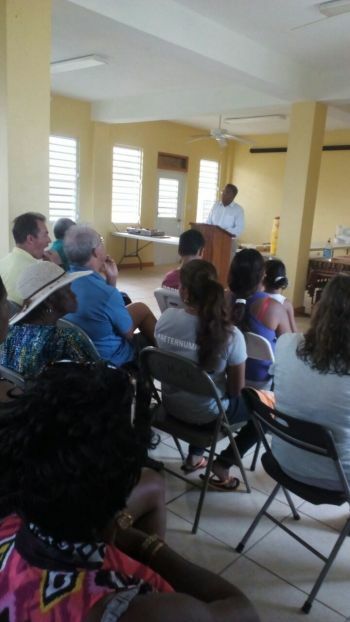 Dr O'Neal, a first-time legislator, was speaking to his constituency at the Catholic Community Centre, Valley, Virgin Gorda on Wednesday October 25, 2017. In a heated exchange, sometimes with a personal jab at the outspoken Director of Tourism Mrs Sharon Flax-Brutus, Hon O'Neal told the residents with much honesty that the current administration "is hurting for money right now...and I am being very very serious…"
He said since the storm "the two main pillars of our economy, Financial Services and Tourism, have shut down...both of them." The Budget "that was passed last year will have a shortfall of $110M," according to Dr O'Neal. The residents told their representative they rarely saw him after the devastating hurricanes and they were disappointed in this, as he should have been around his district "even if he had to sleep on the floor" like some of them were doing. While dodging this criticism of him being AWOL following Hurricane Irma and which resulted in loud applause, Hon O'Neal went on to say, "the Government right now is running on its reserves"...and the reserves could only last for about "three months" or "for so long". The backbencher told the residents on Virgin Gorda that if the NDP Administration of which he is a part does not obtain an injection of funding "our economy is on the verse of collapse". In a serious departure from the rosy picture of his boss Premier Smith, Mr O'Neal told the residents that the main pillars of the economy, Tourism and Financial Services, are "shut down." Speaking on the Premier’s invited trip recently to Washington DC to meet with the World Bank and the International Monetary Fund (IMF), "he secured some loan funding of $50M from the Caribbean Development Bank…to keep the Government going…" Dr O'Neal stated. When pressed about why his administration rushed to the HoA with a Curfew Bill and not a Consumer Protection Bill, he said under the state of emergency "when the Governor was in charge he had the power then to institute some sort of price control." This was met with scorn by persons at the meeting and they told Honourable O'Neal that the state of emergency has long been lifted. The first term representative has flatly contradicted his leader, Premier Smith, who said as recent as yesterday October 26, 2017 at a hastily arranged press conference with selected members of the press that "we are bouncing back" and that "there will be no layoffs of civil servants." His own Deputy Premier and Minister for Natural Resources and Labour, Dr The Honourable Kedrick D. Pickering (R7), also contradicted the premier when he warned of "dark, dark days ahead". With so many different messages coming out of the administration, both the local population and the international community have been in a state of confusion. However, most residents believe the premier is lying about the reality on the ground and the country's financial status and his credibility has been eroded and undermined by his own members. Prior to the two hurricanes and the 2017 August floods and as recent as July 2017 Dr Smith, who survived a coup d’état to remove him as the Minister of Finance, told the people that his government has not left the country broke and that there were millions and millions in the coffers. Former Governor John S. Duncan OBE had disagreed publicly with Premier Smith’s claims, like many others, and he accused the NDP administration of "reckless spending, mismanagement of funds and having no spending priority". They both need to be fired! Disrespectful and rude! FSC and many trust firms are fully operational. These news site and government officials need to be careful with the messages they are being put on the internet to be viewed by our global customers to which we market our financial services too. There's some truth to it however, some financial services firms have actually pulled out. Tourism is what's down right now. You think the bvi is north Korea or Cuba? True. The "shut down" term is misleading. This is not true. Though the financial service industry was interrupted during the storm, it was back a few days later, like less than 1-2 weeks. The financial services firms have not pulled out. Most are in temporary relocation and will be back once their offices and servers are up. Dr Smith have us all for fools. Look around the BVI we are all hurting. Now is the time to level with us. Come clean. We need to know. Listen, 2019 can't reach fast enough. ..the eye doctor will never retain his seat...ndp gots to go! Walwyn, Christian, they alllllll gotta go!!!! @ wize up.agree: talking to us now is joke because most of us all ready hear the same old talk plus we have a few more months before next voting day(it is shameful 365 day per year: for 4 years...do the addition) but to busy buying cars and building houses to visit the small man(now that is ting to talk) but time longer twine!!!!!! I see blame being thrown around at ministers and that's fine for the moment but we can only blame ourselves. We voted them into government after a hasty election with questions that were never fully answered. We lapsed on getting a full audit for the 4 years spent under the party's rule previously. Now we act all shocked when it's disclosed things are dire. Look blame throwing isn't going to help us. We have more power than they do. Virgin island people we cannot continue being laxed for our well being. If it comes to legal or criminal charges filed as a means of survival, I'm sorry but friend or not I'll pick survival. We have been loyal to people who down right lied to us and although it's a little late we have to get the truth as a means of moving pass this. "We too rich for help, but we out begging money" Reality never hit me this hard. The British government will be irresponsible to allow the NDP Administration to borrow money from the IMF or the World Bank, if this is allowed these entities will control our Financial Services Sector and demand that government reduce the Public Service. Just watch they did to the Michael Manley and Portia Simpson-Miller Administrations, these Prime Ministers borrowed money from the IMF in three generations, now look at Jamaica, a country rich with resources, but no ecomony because the bank hit them sanctions in regards to the foreign exchange rate, this has crippled the country's former economy the devaluing of its currency britian cannot afford for this to happen to us. The IMF can control the economy of the BVI. We don't want to go down that road. So I hope the governor is on top of this. No IMF we can do on our own borrow from our local bands and save our economy. Lando stop telling untruths with all your robust talk. Bertie feet were to the fire and the real story jump out! People are not stupid. The people already know the issues with finance, ok. What need to be done is for the leadership team of the country need to stop playing Premier and allow the Premier to be Premier. We know the Police has severe shortfalls and were not in a position to protect the country. What I am reading and have seen is, Politics, Petty Egos Prevail and not Common Sense or any care for the people. The UK should have remained for at least two to three years until things began to get better. Convoy of Hope is very helpful but continuity of Government has become an issue with this virtual coup of the Premier. This is an opportunity to wipe the slate clean. ELECT THE PREMIER DIRECTLY SO HE/SHE WILL NOT BE SUBJECT TO ANY MAJORITY OR BAD BEHAVIOR BY HIS MINISTERS. INVESTIGATE AND FIND WHERE THE MONEY WENT AND ARREST WHO NEED ARRESTING. IMPOSE DIRECT RULE FOR A PERIOD OF THREE YEARS TO REBUILD AND SETUP OPERATIONS FOR THE MANAGEMENT OF GOVERNMENT A LOT BETTER THAN THIS. BILLIONAIRE FRIENDS DO NOT GIVE ANYTHING FOR FREE. THEY SHOULD NOT BE ALLOWED TO NEGOTIATE OUR COUNTRY AWAY TO THESE PEOPLE. SOME MIGHT WANT THE LONG WANTED ISLAND IN NORTH SOUND WHERE A LOCAL HAS A BUSINESS. SOME MIGHT WANT CONTROL OF THE AIRPORT, SOME MIGHT WANT 300 YEARS TAX FREE STATUS, THESE PEOPLE DO NOT GIVE CASH FOR FREE AND THEY SEE US A HURTING SO THEIR FANGS AND CLAWS WITH START TO SHOW. Foolish or not, let the Premier be Premier. Mr O' Neal you are a shadow of a minister before during and after...If u have nothing to say about your country's disaster that contributes to uplifting and support then slither along , please. Decency dictates such in a crucial time as this. The BVI has been given a once in a life time opportunity to cleanse and to rebuild and that will happen. Fate arranged it all while NDP is at the helm and for that many are grateful. NDP as always will withstand survive and stand strong ..Just like their pre Irma completed massive projects (hospital, pier projects revamped roads) and all because the BVI is a blessed place. Your tenure was a complete waste of taxpayers money and warrants a refund. 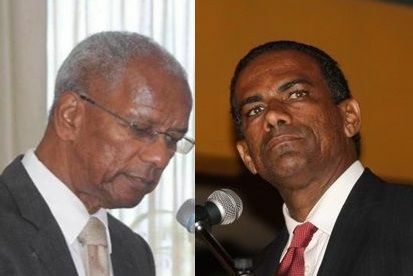 Please I am not sorry for bertie, when Deloris and Alvara and Mitch stood up in the house of assembly and challenged Dr. smith with the airline matter he and wannabe leader Marlon Penn backed down and seem to be kissing up. If the national Democratic Party and it supporters continues to follow dr smith leadership they all going to end up down the rabbit hole and no amount of mood altering drugs is going make the difference. Also how long are we going allow Non elected Jezebel to make the decisions. A baby takes nine months to born. People of the territory do not mind the noise. We have to go through a little bit challenging times . However, trust companies it is time to trust, FSC hang on, statutory bodies hang on for when this baby born we as a country are going to come out on top. The real issue is we will have to open the gates for nothing is free. So the Government need to secure they people for when this beast born if we are not stable the real hurricane will blow us away. Give thanks in all things.